Do not let your missing teeth destroy your beautiful smile. Restore your looks with a dental bridge. Accidents occur every day and many people incur damage in their facial region. This can cause them to lose their teeth. A great option for fixing this type of damage is to repair it with a dental bridge. Remember that a dental bridge integrates functionality and esthetic's to deliver beautiful results. A dental bridge is a fixed prosthesis that helps to close gaps amid missing teeth. It is generally made up of fillers that are attached to a crown on each side and a false tooth is placed in between. The false tooth is called a pontics and it is composed of porcelain, alloy or gold or a combination of these materials. A dental bridge is also supported by your natural teeth or implants. There are several types of bridges. The most common is the traditional bridge, but there are also cantilever bridges and Maryland bonded bridges. 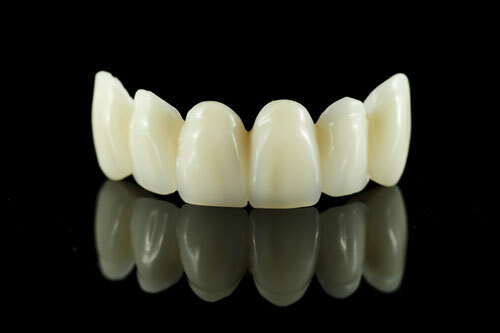 A traditional bridge is composed of a crown for a tooth or implant that is placed on both sides of the missing dentition and a false tooth in between. This is the most common type of dental bridge to use. They are created out of porcelain, ceramics and metals or fused with a combination of these materials. Cantilever bridges are generally not used anymore. Dentists utilize them when a patient has adjacent teeth on only one side of a missing tooth or dentition. This type of dental procedure is not recommended to be used in back of the mouth because it can put too much force on the other teeth and damage them. The Maryland bonded bridges are bonded with resin material. They are made of porcelain or fused with metals such as alloy or gold. We can also support them with plastic teeth or gums and a framework made of metal. What Does This Dental Procedure Entail? This dental procedure can be completed in just a few steps and we make this whole process easy for you. During your first visit to our dental office, we will prep your teeth and the area where the fixed prosthesis will be placed. Afterwards, the abutment dentition will be prepared. Your teeth will be reshaped, re-contoured, and a portion of the enamel will be removed as well. This will allow me to put crowns over them. Next, an impression of your dentition will be made and this mold will be used for creating the dental bridge, pontics, and crowns. Your fixed prosthesis will be fabricated in a dental laboratory. In the meantime, we create a temporary bridge for you to wear to safeguard your exposed teeth and gums while your actual dental bridge is being constructed. On your second visit, your temporary bridge will be removed and then we will check to make sure your dental bridge fits in your mouth correctly. During this process, we may need to make some necessary adjustments to ensure a good fit. You may be required to return for a couple of more visits to check the fit of your framework and bite. Remember that each patient's results vary on a case by case basis. Once you feel good about how your dental bridge fits, we will cement it permanently into place. The cost of this dental procedure will vary depending on the type of dental bridge you elect to get and your dental insurance plan. This treatment will last up to 15 years as long as you practice good oral hygiene and keep your regular routine checkups. Remember that when you use a dental bridge to replace your missing dentition, this can make it easier for you to chew and eat your food. It can also help you to speak more clearly. Always brush your teeth twice a day and floss regularly to help remove food from in between your teeth. This can help slow down tooth decay, prevent gum disease, and stop tooth loss. In order to keep your remaining dentition healthy and strong, it is important to schedule regular dental cleanings to treat any undiagnosed problems or new prognosis. If you feel that this type of dental procedure will benefit you, please call us at (425) 998-6998 to schedule an appointment today.